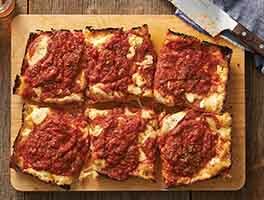 This thick, Sicilian-style pizza — "Pizza Sfincione" — is filled with a simple mixture of tomato sauce, onions, and cheese. Sounds familiar so far, right? 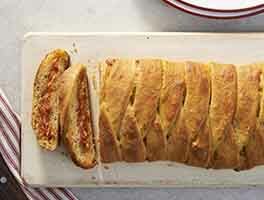 Here comes the twist: it's sprinkled with bread crumbs bathed in olive oil, which bake into a crunchy, tasty topping. Sfincione, loosely translated as "thick sponge," refers to the pizza's thickness and texture. Soft and just mildly chewy, it's a Sicilian tradition on Christmas Eve, New Year's Eve, and Good Friday. The rest of the year, it's a staple at bakeries, where it's prepared in large rectangular pans, and sold by the square. 4 hrs to 4 hrs 10 mins. 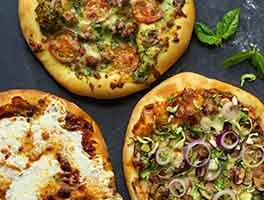 To make the crust: Combine all of the ingredients and mix and knead to make a smooth, soft dough, using a stand mixer, bread machine, or your hands. While the dough is rising, prepare the toppings. Start by peeling and slicing the onions, and frying them with a bit of olive oil till they're golden brown. This will take about 20 minutes. Midway through, add salt and sugar to taste, if desired; about 1 tablespoon sugar will heighten their flavor. Add the tomatoes to the fried onions, along with the Pizza Seasoning, if desired. Simmer and stir for a couple of minutes. If the sauce seems overly liquid, continue to cook till it's firmed up a bit. You don't want it totally dry, like scrambled eggs, but neither do you want it swimming in liquid. Use your judgment. Turn off the heat, and let the mixture cool while the dough rises. Gently deflate the risen dough, and stretch it into an oval in your hands. Plop the oval onto the baking sheet, and press it towards the edges. When it starts to fight back, walk away for 15 minutes. When you return, you should be able to press it to the edges and nearly into the corners. If you can't, give it another short rest, and try again. You want the dough to cover as much of the pan's bottom as possible (without making yourself too crazy about it). 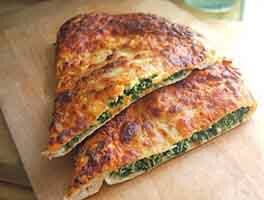 Uncover the dough, and sprinkle it with the shredded mozzarella and provolone. Then spread the tomato/onion sauce over the cheese. Top with the Parmesan, then the bread crumbs. Bake the pizza for 35 minutes, or until the crust and crumbs are brown. Remove it from the oven, and serve it hot or warm. Hint: to prevent a soggy bottom crust, cut the pizza in half crosswise, then lift each half onto a cooling rack. Cut individual slices with a pair of scissors. I made this on New Year's Eve and it was great. The dough takes a long time (mostly inactive) but it's well worth it. Definitely a delicious (and filling) holiday treat. I used homemade bread crumbs (from homemade bread) and I think that made it extra special. I have actually reviewed this before, but it's so good, I wanted to weigh in again. It is a super easy recipe - just takes time for the dough to rise. This time I added a couple zucchini to the filling, and turkey pepperoni over the cheese layer - fantastic as always. The kids gobbled it up and wanted more! Really yummy - give it a shot! the crust is the best. we will use it to make our french bread pizza. thank you! We had this for dinner on New Year's Eve, and I do really like it, but I also added vegetables to the sauce (pepper and mushrooms). (That's the reason I gave it four out of five stars.) Also, I think a bit more cheese wouldn't hurt a bit. (This also had effect on rating.) Would probably only make this once or twice a year because it does take a long time, but yummy just the same. This recipe looked amazing to me and I just had to give it a try. I followed the recipe exactly (including the pizza flavoring). It took a very long time which wasn't a problem for me -- I'm a baker after all. The final result was lacking something plus the breadcrumbs on top didn't really add anything to the recipe and I had high hopes that they would. The crust was nice, the cheese was yummy (duh! ), but I would have added more veggies to the tomato sauce including mushrooms and red pepper to beef it all up a bit. This morning my hubby wanted to put provolone slices over the whole thing and pop it under the broiler for a minute to seal in the breadcrumbs. Not a bad idea. I won't take the time to make this recipe again as is but it was a nice enough experiment on a snowy January afternoon. I'm not a great lover of pizza but my grandson is so I made this for him. I didn't care for all the bread crumbs on the top, they kind of fell off and made a mess. My grandson thought it had a little too much tomato but he still liked it. I think I'm more into the Papa Murphys I can get and take home and bake. This seemed to be a little more time consuming than I like to spend on a Pizza. It certainly is big so I put half in the freezer and will have it again later. The dough was great and very easy to work with. It did keep trying to crawl away but I won the battle. All in all If you like pizza a lot then you will like this one but unless you're a big fan I don't think it's for everyone. My oh my--this is one of those recipes that does take some time to prepare so read it through carefully a few hours before you plan to indulge, but it is absolutely WELL WORTH the time and effort!!! I debated on whether to cut the recipe in half since there are just two of us, but decided if we liked it I would take the chance and freeze the leftovers...This pizza is FANTASTIC--and every bit as good when heated back up in the oven the next day. I was thinking the crust wouldn't stay crunchy with the leftovers, but I simply re-heated it in the oven it was every bit as good. This crust reminded me of the Pizza Hut deep dish crust from 30 years ago--loved it then and now that I know how to make this--will certainly be making it a lot in the future! We love onions and this filling is just over the top. I've never had pizza with topping crumbs like this, and even though ours got too dark around the edges this first time--I'll be watching closer next time and cut back on the temp. 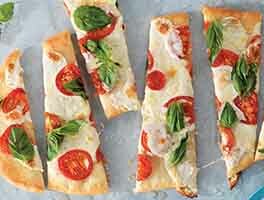 This pizza is the best and absolutely will be making it often--way too good to save just for New Years Eve! This is a great recipe. I remember something similar made with eggplant, topped with bread crumbs this way as well. Just a note: San Giovanni, as regards the festival mentioned in the article does name in English. June 24 is called Nativity of John "San Giovanni" the Baptist, or Midsummer, and it is enthusiastically celebrated everywhere from Sweeden and Estonia, to Italy, to Spain and Brazil. The custom is to place a sprig of St. John's Wort, or, fern leaf or, lily over your door as a sign of welcome to friends on June 24. Serve them wine, cakes, and this pizza. There were too many bread crumbs. I had to brush off alot before my husband and I ate it. I loved the crust and I loved the filling. If I ever make it again I will put much less bread crumbs on it. I also baked it less than the time in the recipe.